Happy SEPTEMBER! Now that my brief hiatus is over & I’m caught up, I’m officially back to work and busy as ever! 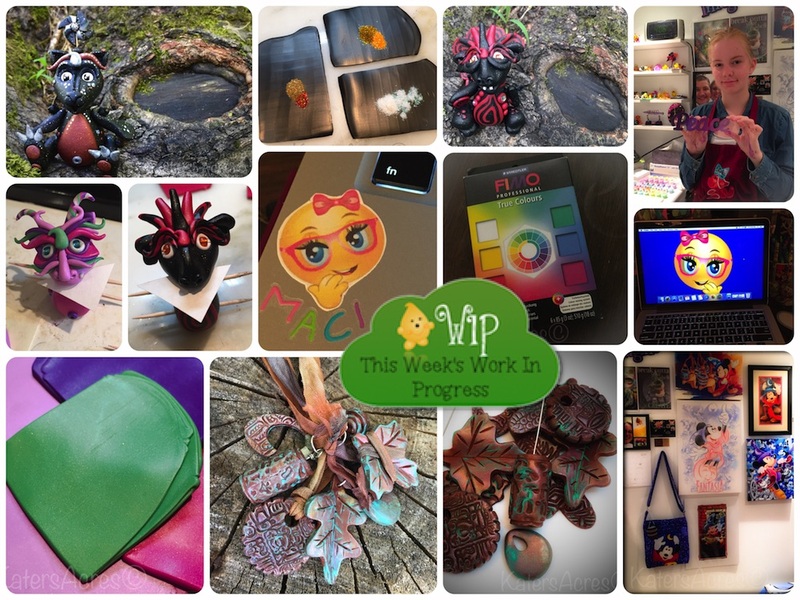 Last week I celebrated 5 years on Etsy. To each of you who have adopted a figurine or purchased a tutorial, from the bottom of my heart, thank you. I’m overwhelmed by your love. There’s another special event tomorrow and you will not want to miss it, so make sure that you are signed up to receive coupons for special sales in my Etsy shop. I’ve been so busy with adoptions that I ran out of my signature wrapping materials, the muslin bags with Parker & Lolly and the gift boxes for StoryBook Scenes and the Dragons. So this week had me busy making more for the fall season. About 100 more are ready to have your adoptions placed inside. I’m a member over at Christi’s Neighborhood. This past month’s project was “Once Upon A Time.” I made a Rumpelstiltskin tile that featured a faux pen & ink drawing. You can get the tutorial here. Last week in my weekly tidbits, you read that I went to Lake Erie and spent time collecting some awesome rocks. I turned this Lake Erie rock into this little “castle on a rock.” This too was a project from Christi’s Neighborhood. Oh yes, and there’s the color … I’m a color addict and I love making new color palettes for my dragons and other creations. Here’s just two of last week’s palette. Every once and awhile I share those color recipes or palettes with you. CLICK to get color recipes. CLICK to get color palettes. See that pile of browns & neutral based polymer clay colors. Those were “left overs” from another project and made the most yummy brown color. You’ll see what came of it soon. This lovely bead has a story. Inspired by Debbie Crothers (an artist that never fails inspiring me) recent image transfer beads, I purchased the tutorial and quickly whipped up my own. However, I was so distracted by my audiobook, singing, playing with my studio assistant, and in general not paying attention that I got it stuck on the stick. I haven’t taken it off yet, but will this week! Last but not least, I played with paints this week. 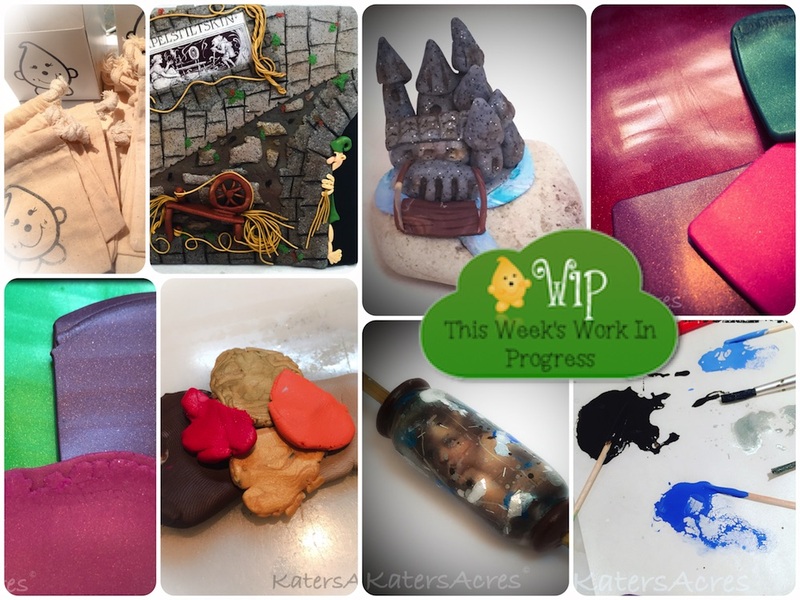 Oh polymer clay and paint, how I love thee! One of my most used tools in the studio is my recycled paint palettes. READ about them here. When it comes to paints, while you can spend big money for professional level paints, if you are going to add water to them, there is really no reason to spend the money on them. The paint from big box stores (like JoAnn’s, Michael’s, Hobby Lobby, & Pat Catans) that are $1 a bottle will work just fine. In many cases these paints are better for faux effects and patina than their counterpart high end paints. And at $1 a bottle, you can buy every single color available. Fall is just around the corner. Both the Fox Tutorial and the Turkey Tutorial are some fall favorites. They are instant downloadable PDFs. Click the links above to go to them. This past weekend was incredibly busy! We celebrated my Grandma’s 90th birthday (see picture at left) and I caught a large mouth bass at our church finishing trip & picnic (see picture at right). Many of you have already downloaded the Polymer Clay Planner Stickers PDF that I added several weeks ago. I love how many of you use planners too. Some of my new favorite digital paper & clip art kits come from DigiKika on easy. Be sure to check her out.